The artwork is now on display in the Howgate alongside the Our Falkirk Steeple exhibition about the history of the Steeple. Susheila and I spent yesterday setting it up and it looks great. We hope as many of the schools and pupils can come along and see their work. I think we all had great fun during this project and hopefully we can organise another art project soon. We have now reached the final week of the art project. Pupils and Teachers alike have really enjoyed taking part and learning new skills. I know I speak for both Susheila and myself in saying that everyone has worked really hard and we have had great fun working with everyone involved. So what did we do this week? The carved panels were designed as woodcut prints, so this week pupils learnt how to ‘ink’ them up then make prints of their Steeple designs on different coloured paper. It was great fun and we all got inky fingers. Have a look at the photos below. All the completed artwork looks FANTASTIC and I cannot wait until the exhibition in September showcasing the pupils work to the public. I hope you all get a chance to come along. Have a great summer. 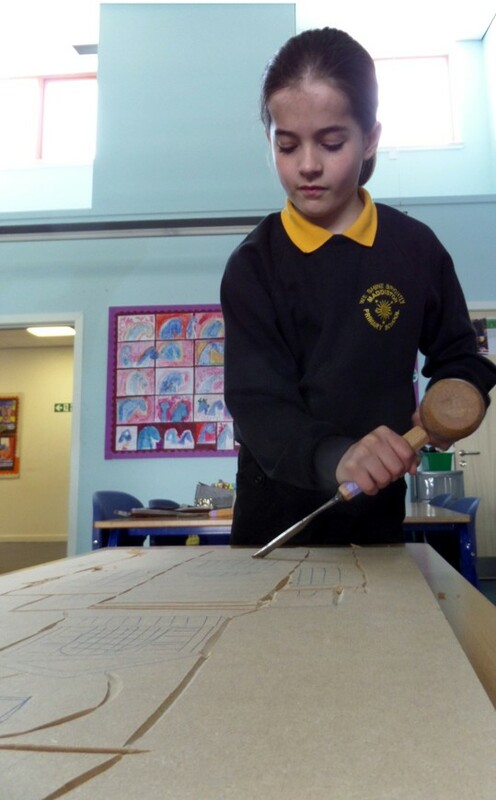 This week the pupils finished carving their steeple panels. The finished designs look fantastic. Susheila is currently organising a fourth session with the schools so the pupils can create ink prints using the panels. Have a look at the photos to see what the pupils have been doing. Week Two: Let’s start work! 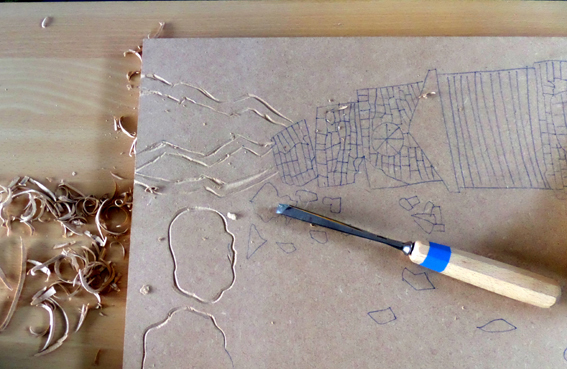 Last week saw the pupils starting to carve their woodcut designs into MDF panels. It was a really busy week for Susheila preparing between 6-8 panels for each school involved. There were some brilliant designs from the first week and we wish we could have chosen them all to be carved. 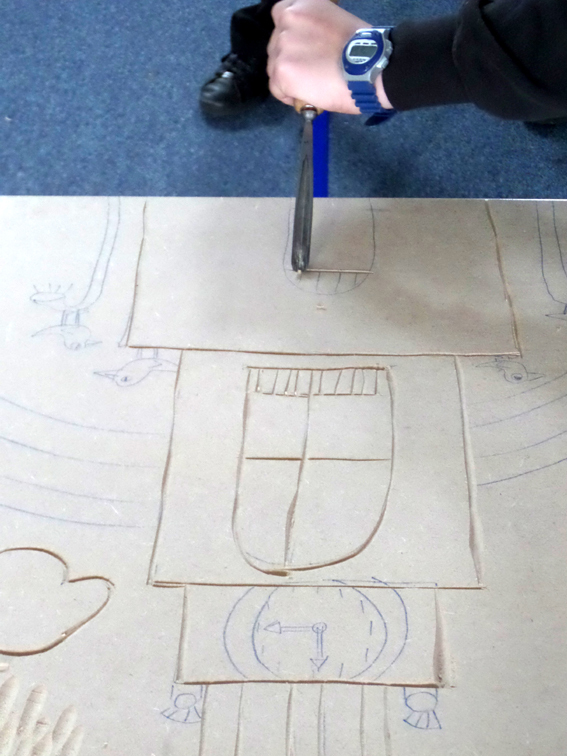 With each class Susheila got the pupils to have a go at carving straight and curved lines before they started work on their steeple panels. There was some fantastic work from all the pupils involved and we look forward to seeing how the students get on this week. The first week of the project is coming to an end and Susheila and I had a great week meeting the pupils involved and telling them about the Steeple’s history. We hope the schools enjoyed finding out more about this iconic local building. Having learnt about key events surrounding the Steeple (there was particular interest in the Steeple being hit by lightning in 1927 and the ill-fated horse Irn-Bru) the pupils did some sketches of the different events. These ranged from what the Steeple used to look like, what it looks like today and sketches of details of the building. 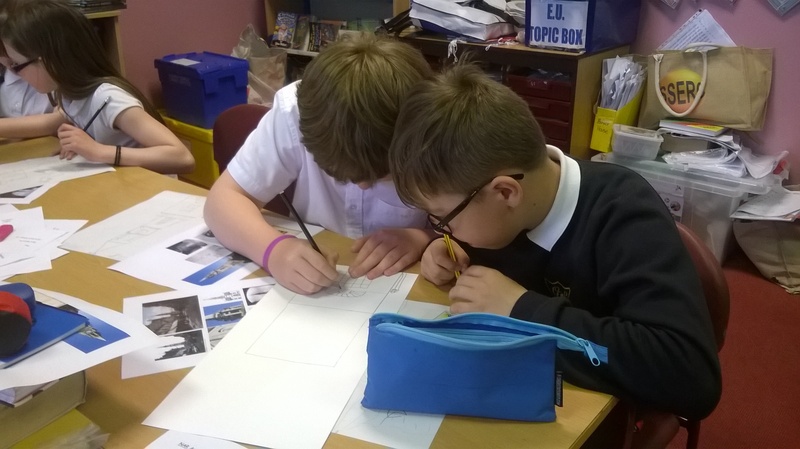 Using their sketches in pairs pupils created designs for woodcuts which they will start carving next week. Susheila and I were very impressed with the work done and there are many budding artists among the pupils. We look forward to seeing how they get on next week. P6a are very excited to see the end outcome. We loved this mornings session where we learned about the Falkirk Steeple, drew pictures of the Steeple and the different aspects of it. 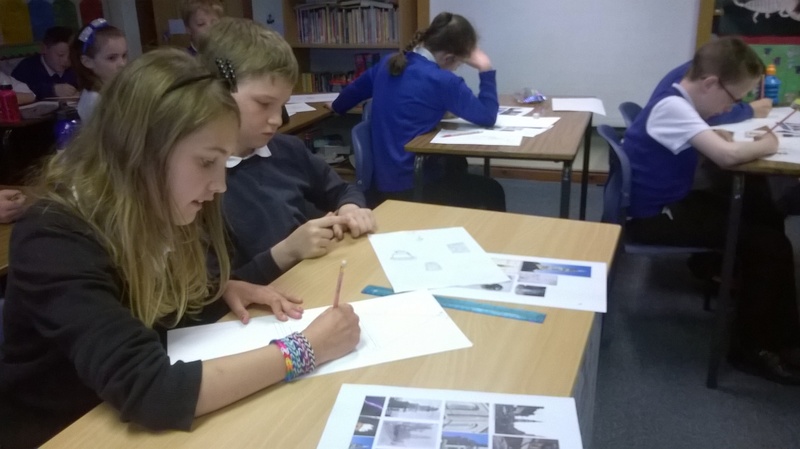 Welcome to our blog for the ‘Picturing our Steeple’ art project. The project officially starts on Tuesday 20th May 2014 and the Falkirk Schools involved will be posting about what they are doing and learning. Check back after the 20th May to find out how they are getting on.